Before Tomorrow (2008) is the third and final chapter in The Fast Runner Trilogy, beginning with Zacharias Kunuk's arthouse hit Atanarjuat The Fast Runner (2001) and followed by festival favorite The Journals of Knud Rasmussen (2006). 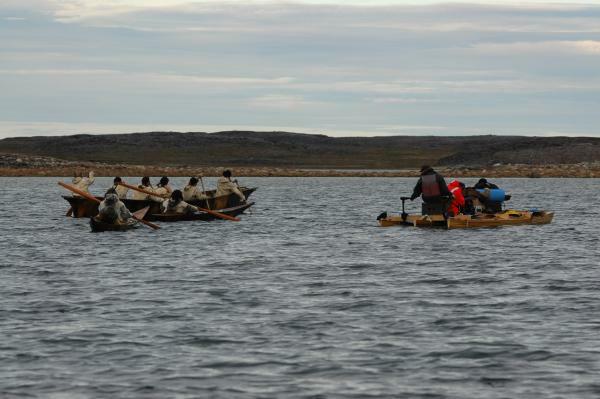 BEFORE TOMORROW is set in 1840, a time when many Inuit had yet to meet white people, and thus maintained their traditional way of life. The ballads of Kate and Anna McGarrigle set the tone for this tender, affecting tale of a small boy (Paul-Dylan Ivalu) and his beloved grandmother (co- director Madeline Piujuq Ivalu), caught between the harsh Arctic wilderness and first contact with the outside world. BEFORE TOMORROW is based on the novel “Før Morgendagen” by celebrated Danish writer Jørn Riel, and has been translated into 8 languages. Two isolated families meet for a summertime celebration. Food is abundant and the future seems bright, but Ningiuq, a strong and wise old woman, sees her world as fragile and moves through it with a pervasive sense of dread. 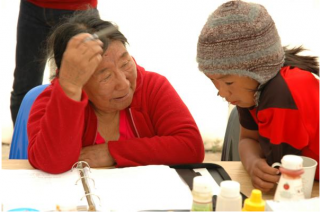 Ningiuq and her grandson Maniq are dropped off on a remote island, where every year, the family dries the catch and stores it for winter. The task is soon finished. As summer turns to fall, they wait in vain for the others to pick them up. The story is set circa 1840, when some Inuit tribes had yet to meet white people, although rumors were circulating about where they came from and why they traveled. After many years of isolation, the summer celebration is a time when young people get married, plans are made for the future and food is abundant. In these joyful surroundings, strange artifacts from the outside world, a steel knife and wooden pulley, are examined. Kukik, an elder, describes the curious customs of white people he has met, who greet everyone with powerful handshakes and drink a burning liquid that makes them all fall down. and finally, the young people, who have entered into contact with the Western world which exhorts them to learn, first of all, the tools and skills of that culture before those of their grand parents. Alternating interviews and scripted portions offer different approaches for exploring our chosen subjects. 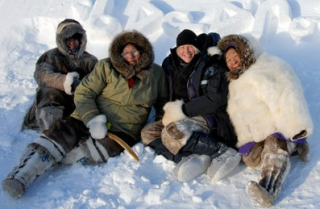 The goal of Arnait Video Productions (Women’sVideo Workshop of Igloolik) is to value the voices of Inuit women in debates of interest to all Canadians. How does one expe- rience the dawning of the third millennium in a small Inuit community that is in the midst of political and social change? Since its beginnings in 1991, Arnait Video Productions (AVP) has traced a trajectory revealing the originality of its producers, the context of their work and lives, as well as their strong desire to express cultural val- ues unique in Canada. Working in difficult social conditions –through community and family problems as well as pre- carious financial situations – the sheer endurance required on the part of the women in Arnait to produce these video documents testifies to the importance of the project in their lives.